The Saints had a busy week getting ready for this week’s game. Last Saturday, the Saints lost their first game of the season to the Dallas Cowboys. They look to rebound this week against the Tampa Bay Bucaneers, who beat Seattle 24-7 last week on the road. 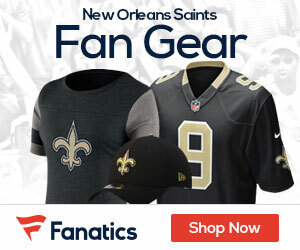 – The Saints can clinch Dome fielld advantage through the NFC playoffs with a win or tie or a Minnesota loss or tie this week.The last time the Saints made the playoffs, they lost the NFC Championship game in wintry conditions in Chicago. – With his short touchdown pass to Lance Moore, Drew Brees moved to first place on the Saints career TD pass list with 121, one better than former Saint Aaron Brooks. – Reggie Bush is recovering from a cramp suffered last week and is probable for Sunday’s game. Bush limped off the field early in the game against Dallas. – TE Jeremy Shockey, DT Sedrick Ellis and S Darren Sharper are all questionable for Sunday’s game vs. the Bucs. LB Scott Shanle and CB Randall Gay are questionable for the game as well. Both players suffered concussions last week and have not been medically cleared to play yet. – CB Jabari Greer practiced for the first time since having sports hernia surgery. While listed as questionable for Sunday’s game, he will likely not play. This is good news for the depleted secondary. Greer expects to be fully ready for the Saints’ playoff run. – The Saints look back to get back on track on offense. The Saints struggled all night on third down, converting just one of seven attempts. The 17 points the Saints scored last week was their lowest of the season and the first time in 22 games that the team failed to score at least 20 points. – DT Anthony Hargrove was selected as the winner of the Ed Block Courage Award by his teammates. Every year, each team selects a player who best exemplifies sportsmanship and courage. Hargrove, who has started at DT this season, has made the best of his second chance in the NFL after a series of arrests and drug suspensions marred his early career. I am a middle-aged life-long Saint fan. Let’s face reality. The Saints defense is currently ranked 24th. I hate to admit it but I truly believe that their poor defense will not allow them to win a playoff game.